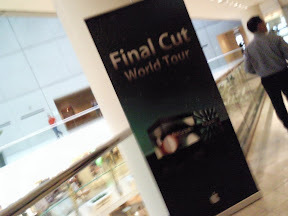 The Final Cut World Tour finally landed in Singapore, at the Raffles City Convention Centre. Event was packed and they ran out of seats, so a bunch of people had to stand throughout the presentations. I suspect it’s because they didn’t limit the number of registrations, since on a whim, I decided to do a dummy registration yesterday and it still went through. I remember when Adobe had their CS3 demo session, seats ran out very early even though they held it at a bigger venue [Suntec Convention Hall], which was easily 2.5x Apple’s venue. Then again, Adobe was demonstrating a range of products that targeted print people, designers, illustrators, web developers, Flash developers, video professionals, motion graphics artists and the new market of medical/industrial professionals. So, not a fair comparison. The Final Cut World Tour felt more… familiar, kinda warm and fuzzy, since even when your big post-production and Hollywood movie studios are using Final Cut for their post, they are still essentially using the same FCP interface [of course, their systems are… "very high end"]. The Adobe event felt more exciting, a lot more showmanship, as compared to the marketing/sales pitch [shareholders’ meeting?!] feel of the World Tour. Other big difference is that there was more interaction during the Adobe event, plus a Q&A session – both of which were not present at the World Tour. Then again, the World Tour took about 3.5 hours, the Adobe event was full day. Enough of random comparisons. Back to the main event – the Final Cut World Tour. Much of the first half was spent on the features of Final Cut Server and how it helps your workflow. Quite cool, especially if you run a shop that has editors, colorists and artists working with FCS applications. The main selling point is that it’s highly customizable for your workflow, which they demonstrated using the case study of a post-production facility that did a reality program on the Beijing Olympics, with post-production setups in USA and China. We’re not doing anything of THAT scale, but the idea of having transcribers and translators working concurrently on the footage and exporting XML which can be brought in as subtitles delighted me. The ability to automate the review workflow [eg: auto export to H.264 – upload onto a web page – email notification – client/producer can make notes based on timecode – comments feed back to editor] is very neat as well. Not enough reasons for us to buy the Server though. The price of the Server itself is quite accessible – around $1,500 for the 10-seat license and around $3,500 for an unlimited version. But obviously you’ll need a solid hardware system to support it and someone who is able develop a workflow that works for your projects. Ran intp the technical manager of my alma mater after the event and he said they’re gonna get a visit from the Final Cut Server guys to talk about the system. Sounds good, especially since they have upgraded to FCS2. There are 4 AVID Adrenalines in school, but I remember fondly the time I spent in the less glamorous Final Cut lab [only fluorescent light!] when I was doing up my graduation short film. I was one of those rare people who went straight for the FCP option – didn’t even bother with balloting for the AVID, heh. The rest of the afternoon was spent showing how FCS2 integrates Motion, Soundtrack Pro and Color together with FCP, so you can port your footage and project to and fro easily, with instant updates when changes are made in any of the applications. The one thing I really got out of the session was: time to start playing around with Motion. My feeble ‘motion graphics background’ is based on Adobe AfterEffects – because I had a really good trainer back in school. But a motion graphics artist is not created over one final semester [I blame attribute it to the school curriculum for not starting us earlier in motion graphics, since we wasted an entire Year 3 ‘Advanced Multimedia’ curriculum on Flash]. I have done fairly simple motion work in AE [when trying to animate 30+ layers in FCP proved to be a lesson in madness], though I have done quite some bit of keyframing and compositing in FCP as well. From the demonstration, Motion’s principles seem fairly similar to AE, especially when he was demonstrating the use of 3D space. There was extensive demo [twice, in fact] of Color – which was quite exciting to look at, since it doesn’t look THAT imposing anymore, even though you can most definitely achieve a lot more if you know how to work the advanced details. For a marketing event, surely you don’t talk about the drawbacks, since I remember one of the main complaints about Color is that it still can’t handle nested sequences properly. In comparison, there wasn’t much talk about Final Cut Pro itself. No mention of the cool Smoothcam feature I read a lot about when it first came out. The feeling I got was that this was not about selling the FCP that many editors had grown to love but to push for those who haven't upgraded to FCS2 to seriously consider doing it [ProRes 422 is something they mentioned quite a bit]. Plus, to see the value-add in the other applications neatly integrated into the workflow. I had a moment of Deja Vu [which I couldn't trace back, as Deja Vu moments tend to be; was it during the Adobe event? Read off some editing site/forum/newsletter? ], when the seemingly most simple of features turned out to be A Very Big Thing. The loudest applause and maddest props were given to this particular demo of Soundtrack Pro 2 where the presenter showed how, with a simple step or two, you could easily remove ambient noise AND audible audio clicks/pops – which you tend to get when you boom a shot in the great outdoors. The really neat thing is that you see the waveform itself morph into ‘what it should be’. All this applied on a clip from a real-world project [stamp of authenticity there]. On playback, the audio was remarkably clean. Simple solution to your everyday problem = most appreciated. There were a few supporting vendors outside the venue, notably the Matrox MXO, BlackMagic and... The RED Camera [the Panasonics in the other end of the space didn't seem to get the same level of interest]. After seeing many variations of glossy photos of the RED camera online [plus footage], it's hard to be wow-ed by the actual camera, especially since I don't remember seeing any demo footage being played alongside it. Superficial Sidenote: end of the seminar, there was a lucky draw, with the awesome and exclusive [read: 'one'] prize of... an iPod nano. Meh :P C'mon, show us FCP groupies some [more] love! I remember Adobe gave away... three Production/Extended Suites during their presentation! Couldn't hurt if Apple gave away a nice set of FCS2... right? I wish, I wish. Still running FCS1 now. Works great for our current needs, though since we also shoot on HDV, ProRes422 is something that would help with our workflow.